"When I changed into another position, I see just the most surreal sight," McKown said from his bed at Tacoma General Hospital. "It's a young Arabic-looking boy . . . with a ball cap on and an AK in his hand." McKown drew his 9 mm pistol but then had second thoughts of shooting "a kid." McKown told Dominick Maldonado (the shooter), "I think you need to put that gun down, young man." The "kid" turned and shot McKown five times, once in the leg and four times in the torso. "Every one of his shots got some part of me," McKown said. McKown’s reluctance could easily have cost him his life. The Cooper Color Codes, as Jeff Cooper promulgated them, were not a system for describing levels of potential danger, but rather a technique to enable a law-abiding citizen (i.e. someone in McKown’s circumstance) to overcome a natural reluctance to use lawful deadly force against another. Quoting Jeff Cooper: "The color code is not a means of assessing danger or formulating a tactical solution. It is rather a psychological means of overcoming your innate reluctance to shoot a man down. Normal people have a natural and healthy mental block against delivering the irrevocable blow. This is good, but in a gunfight it may well get you killed. The color code enables you to change your state of mind by three steps, each of which enables you to overcome your mental block and take lifesaving action." Completely unprepared and unaware of your surroundings. In Condition White you may be in deadly danger and not realize it. If you are attacked in Condition White, you are unlikely to be able to effectively respond and you may be seriously injured or killed. State of relaxed alertness and situational awareness. In Condition Yellow although you are not aware of any specific situation that may call for immediate action, you know that you may have to defend yourself today. You understand that the world is full of hazards, many of which are human, and that your readiness to take defensive action can mitigate these threats. If you are attacked in Condition Yellow, you will probably prevail if you are armed and may be able to take effective action even if unarmed. 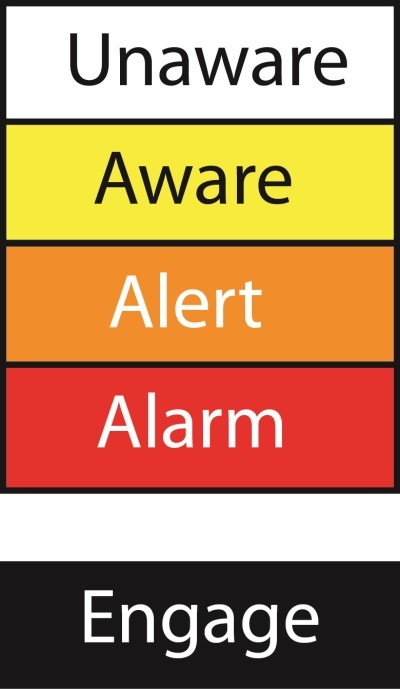 In Condition Orange, you become alert to the possibility deadly threat in your immediate environment. In Condition Orange you understand that you may have to shoot a specific threat, right now, today. 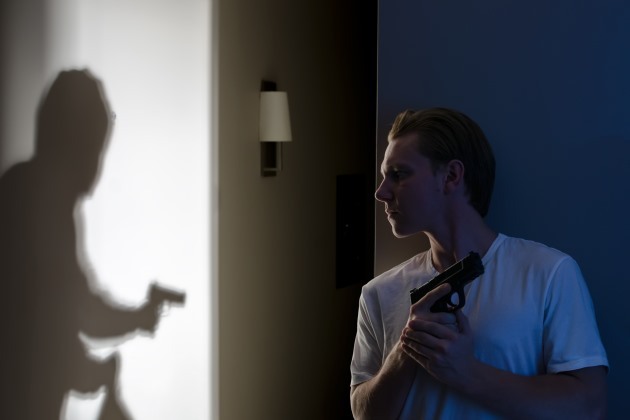 At this point your normal reluctance becomes easier to overcome because your training tells you that someone is threatening to use unlawful deadly force against you or another innocent. You begin actively looking for threat indicators and start conscious analysis and assessments of potential threats. Although you remain cognizant of the legal and moral aspects of the situation, you focus your mind on the possible need for immediate defensive action. Looking deep — what’s in their hands? Are they looking at you or past you? Can you safely leave the area? Should you? Your hand may establish a firing grip on the pistol, you may draw the pistol at home, but probably not in the shopping mall or other crowded public place. The actions of that threat — standing right there — dictate your next moves. You have drawn your pistol because you are justified in taking the threat at gunpoint; you can articulate why this is so. In Condition Red, you have decided to act the instant the threat’s behavior warrants an immediate response. You wait for a trigger or take other lifesaving actions as the totality of the circumstances dictate. The color code as many instructors currently teach: The threat has tripped a final trigger. You must immediately use proportional deadly force to defend yourself or another innocent. Cooper contended that "Condition Black" was unnecessary and that Condition Red sufficed because in his view you have decided you are ready to use lawful deadly force when you enter Condition Red and as a result, there is no need to go beyond that condition. As stated above, many who teach Condition Black contend that there is a difference between being ready to act and deciding to act; that being in a Condition Red state of readiness does not necessarily imply immediate action. So, is Condition Black necessary? I guess it depends on how you view the problem. If the color code “conditions” describe a state of readiness as well as a mindset, then Condition Black is not necessary as Cooper contends. Once a critical trigger is tripped in Condition Red, you are no longer in a state of readiness, but rather a state of action — you are actively responding to a deadly threat. If you accept this view, black may be a decision point; however, it is not a condition. Massad Ayoob teaches that Condition Red delineates the gunpoint situation where you have clearly identified a threat (I am ready to shoot this person) but the threat is not using unlawful deadly force at that instant (I am not going to shoot this person yet). Ayoob defines Condition Black as the instant an unlawful assault using deadly force is in progress upon you or other innocent people. In other words, a trigger or decision point at which we have no alternative but to use lawful deadly force to neutralize the threat. In this view, Condition Black describes the various triggering events that cause you go from readiness to action. The threat does appear and you take the threat at gunpoint ready to fire. Do you need another psychological mechanism to help you pull the trigger? Jeff Cooper would have said no and I tend to agree. I don’t think we need a “Condition” Black; however, describing Black as a decision or trigger point may be useful after the event. This is the first of two articles on the topic. In part 2, I will provide examples of how the color code can equate to judicial standards of proof and some specific examples of the color code conditions addressing real world events such as the Tacoma Mall shooting I mentioned in the introduction.